The Labour Party made significant gains in the February 2011 election, almost doubling their share of the vote nationally and increasing their number of Dail seats from 20 to 37. Due mainly to the party’s ability to win transfers from a range of different parties and political groupings, Labour attained a seat bonus of almost 3% in winning 22.3% of the seats on a national vote share of 19.4%. Despite this, further small swings to the party in a number of Dail constituencies could see further seat gains being made by Labour, as the map above suggests. 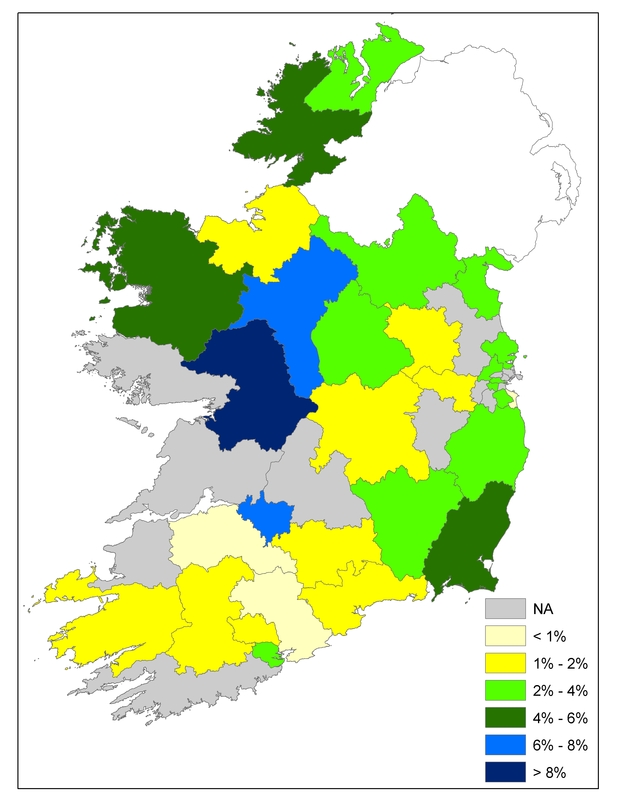 In all, a small swing to Labour (of 2%, or less) from other parties could see further seat gains fall into the party’s hands in a number constituencies (highlighted by the yellow shaded constituencies on the map), with a particular cluster of these target constituencies being located in the Munster region. If the party had managed to win such slightly higher support levels in the last general election in the 13 constituencies that fall into this category, then Labour would have ended up winning 50 seats at the election, and the overall seat tallies by party would have looked as follows: Fine Gael 73, Labour 50, Fianna Fail 17, Sinn Fein 11, United Left Alliance 3, Others 12. The Labour-Sinn Fein dynamics are especially interesting here. While a resurgent Sinn Fein is viewed as posing a significant threat to Labour on the left of the political spectum, the previous post relating to Sinn Fein target constituencies did not identify any constituency as being one where a Labour seat would be lost on the basis of a 2%, or less, swing to Sinn Fein, whereas three Sinn Fein seats would be lost to Labour if there was a 2%, or less, swing from Sinn Fein to Labour in the Cork East, Dublin Central and Sligo-North Leitrim constituencies. Of course there are other constituencies where Labour seats would be especially vulnerable even on the basis of slight swings in support to other parties, as highlighted by the earlier post on overall constituency marginality in the February election. Constituencies that would especially fall into this category include Cork South West, Dublin North East, Dublin South East and Galway East, as a swing of 2%, or less, away from Labour to opposing parties could see these seats fall out of the party’s hands. Of course, as with the earlier posts relating to potential target constituencies for Fianna Fail, Fine Gael and Sinn Fein, the elephant in the room here relates to the strong likelihood that there will be a significant reduction in the number of Dail seats for the next general election. As with the 1981 General Election, such a significant change in Dail representation levels will effectively prove a major “game changer” and could well shift the dynamics of electoral success decidedly towards/away certain political parties and political groups and could well act to accelerate the level of political change that may be associated with that election. Alas, such significant boundary changes will also alter the context on which was based the recent four posts relating to different parties’ potential targets for the next general election. This entry was posted in Election data, Electoral Geography (voting maps), Marginality and tagged Labour Party, Marginality. Bookmark the permalink.